The European migrant crisis is being fueled by free cash handouts from the United Nations, European Union and George Soros’ Open Society Foundations, according to bombshell information from Europe which suggests the UN, EU and Soros are luring illegal migrants to the continent with money. For years, many people have been puzzled how so many “impoverished” migrants are able to raise such large sums of cash — sometimes up to $50,000 — to pay people smugglers to transport them from Africa to Europe. Yet more cash is then required for the migrants to travel through Europe, surviving on the fringes of society until they are granted government support or gain employment. What exactly are the cards? 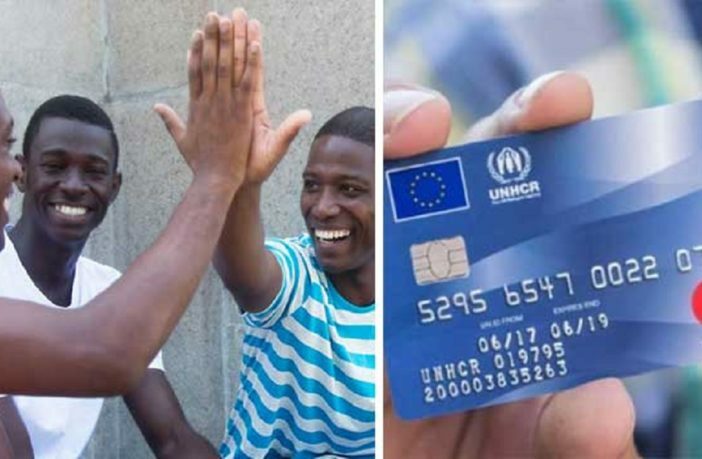 UNHCR and the EU, in cooperation with MasterCard and Soros, generously hand out prepaid debit cards to the migrants. The prepaid debit card scheme is operating under the auspices of the United Nations’ World Food Program, and the aid is intended to be used for the purchase of food. However, according to a police officer interviewed by a Slovenian news outlet, the migrants are not spending the money on food, but rather high-quality boots, hiking clothes, smartphones, and even weapons. “The migrants we catch and return back in a few days or weeks are again trying to break into Croatia. Some of them are really poor, but many are well-equipped and well-equipped: they have new footwear, new clothes, sophisticated smartphones, cold weapons, and some have also found Mastercard’s banknotes without name, they are just numbers. They raise money at ATMs, but we do not know who pays them,” said a local policeman at the beginning of September for kamenjar.com. Now we do know who pays them. George Soros is the mastermind and financier of the European migrant crisis and the prepaid debit cards, enabling so many impoverished migrants to make the trek to Europe, have now been exposed as a key tactic in the Soros playbook. In a press release last year, MasterCard announced a cooperation with George Soros with the aim to “catalyse and accelerate economic and social development for vulnerable groups in the world, especially refugees and migrants”. The press release further stated that George Soros had earmarked up to $500 million for private investment that will increase capacity to meet the challenges faced by migrants, including refugees, and their host communities across the world. The prepaid debit cards are stamped with both UNHCR (The United Nations Refugee Agency) and EU logos. No identity documents are required to obtain or use the cards. The cardholder’s name is not even included on the card. Instead, “UNHCR” and a number is printed on the card. On Mastercard’s website, we can see that such cards by UNHCR are awarded to illegal migrants under the World Food Program, and MasterCard is in charge of technical assistance in solving the problem of sending money to migrants. In Lebanon, for example, Syrian refugees receive the sum of $27 each month for each family member on the card, according to figures from 2013. $192 million was spent on this program in Lebanon, Jordan, Iraq and Egypt. The website also says that 300,000 people had received the card by the end of 2013, and by the end of 2014, they expected to distribute 2.5 million more of the cards to be used in Egypt, Iraq, Jordan, Lebanon and Turkey. With so many millions of people using the prepaid debit cards, MasterCard obviously benefits. The question of whether Europe and its taxpaying citizens benefit from the secret debit card scheme is a different question altogether.